These days, weddings are more than just a special day–they’re an expensive day. The average cost of a getting married in the U.S. swelled to over $32,000 in 2015, even while median household incomes remained around $54,000. If you and your fiancée are financing your wedding on your own, you may not want to spend over half your annual income on one day (no matter how spectacular that day is). Luckily, there are lots of ways to cut costs on your wedding day without sacrificing quality. One of the easiest ways to keep your wedding costs down is shopping smart, even when it comes to your wedding rings. The common suggestion is that you spend three percent of your budget on wedding bands, but with a few simple tricks you can save on that three percent (and free up some cash for the honeymoon). The best way to save money on your wedding ring is to go with a simple band made from a cost-effective metal such as 14k gold (yellow or white), titanium, or cobalt for men. Many of the most popular wedding ring styles today focus on the detailing, rather than the diamonds–which is not so far off from a vintage look! Victorian and Edwardian rings were known for their elegant engravings, and modern technology such as 3D printing has made it easier than ever for jewelers to achieve those intricate styles at a fraction of the price. You can either go with a traditional vintage motif, such as flowers, birds, or milgrain detail, or add a personal touch with a custom engraving or fingerprint. For brides who just have to have some bling, there are ways to get a diamond wedding ring at an affordable price! Enter any jewelry store or visit an online retailer and you will find a huge number of beautiful rings on display–examples of what you might one day wear on your finger. But if you’re on a budget, you’ll be better off turning a blind eye to all those preset rings and focusing on the stones themselves. Believe it or not, loose diamonds are actually cheaper to purchase. Choosing a loose diamond, rather than a ring, allows you to focus on the quality of the stone so that you get the best deal possible. It also gives you more room for creativity when it comes time to set the diamond; again, you have more options than ever when it comes to customizing your rings, especially if your’re looking for matching vintage wedding ring sets. When you consider the right diamond for your wedding ring, you’ll wind up faced with a big decision: what diamond shape should you choose? There are many differently shaped cuts available these days, and they all are beautiful. 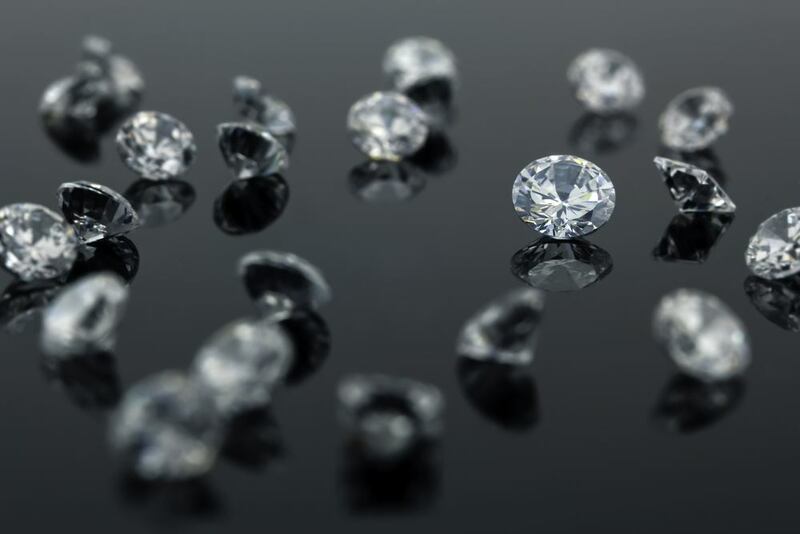 Be sure to keep your budget in mind and select the right diamond shape for you. Vintage style diamonds, such as round or princess cuts, have long been the popular choice for diamond engagement rings and wedding bands. As a result, they tend to cost less than the newer, more modern styles. A simple vintage wedding ring is classy, timeless, and beautiful, and you won’t have to break the bank to get a piece of jewelry you’re truly proud of. 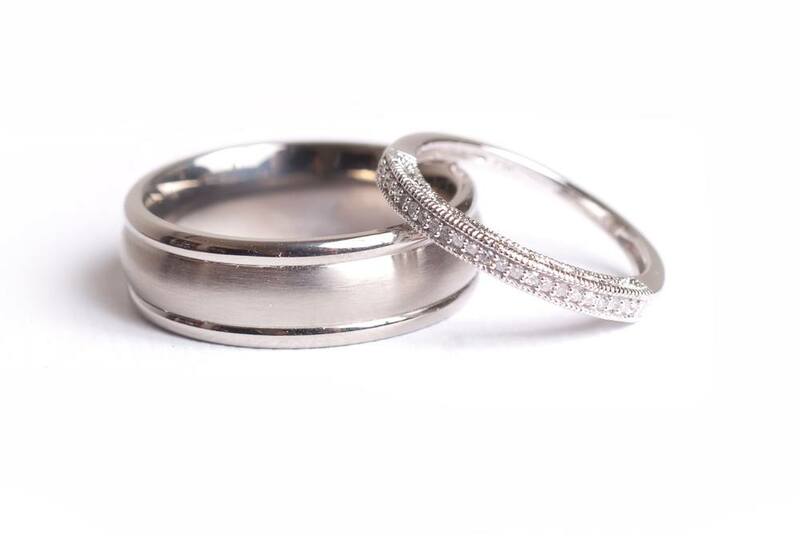 At Brilliance, we offer a variety of styles for women and men looking for simple vintage wedding rings. For example, this antique floral diamond wedding ring has thirteen round cut diamonds, but is not overstated. It has beautiful floral details on the sides. White gold is also more cost effective than platinum. Men’s rings have a little more versatility in the styles for vintage looks–as many rings at Brilliance are inspired by material just as much as style. The Antiqued Flat Satin Men’s Wedding Ring with Rose Inlay in Cobalt is a perfect example of fusing old with the new. Two antiqued silver inlays draw the viewer’s eye to the rose gold inlay, for a masterpiece of beauty. 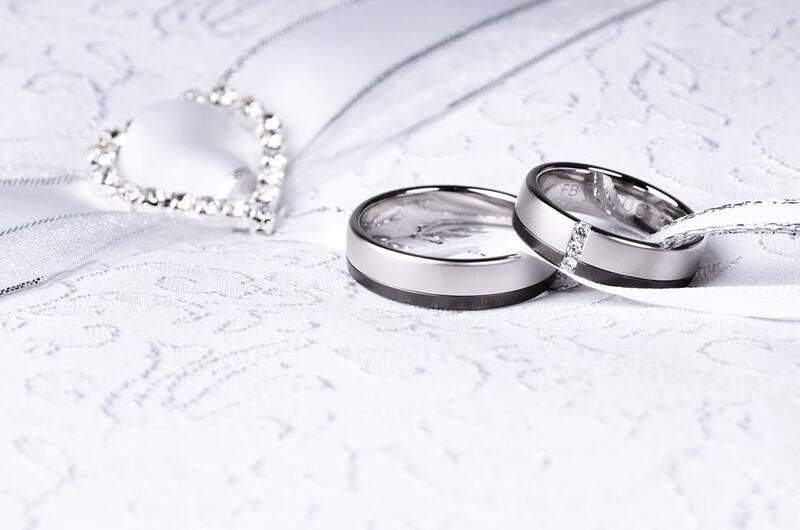 No matter what your budget is for your wedding day, a little know-how and a lot of smart shopping can ensure you and your future spouse have beautiful wedding rings you’ll admire for life.